I didn't achieve the intended effect of the Performance Menu Mass Gain Program. Deprived of a single measuring device at home or in the gym, I jumped on the scale at Crossfit Topsfield last Saturday, expecting to see two or three extra pounds. At 165, I'd lost 5-plus pounds after 6 weeks of "bulking". My unwillingness to endure three to four rest days per week had led me to the opposite pole. Weight loss. Any idiot could tell you that two double sessions a week stacked with three WODs would lead to some serious calorie burn. I was adhering to the P-Menu Program (3 or 4 workouts per week), learning kettlebells and joint mobility (2 workouts per week), and doing two or three Crossfit WODs every seven days. I couldn't consume enough food to keep up with the caloric demands of the regimen, and frankly, I wasn't trying that hard. Trader Joe's was sucking about half my salary out of my wallet every week, and stuffing your face six or seven times a day can get monotonous. In retrospect, it's obvious that I was below my 3000-calorie maintenance threshold. Amazingly, I felt great. Despite the schedule, I was getting three rest days per week. Tuesday, Thursday, and Sunday, I was relatively sedentary, provided the crew didn't goad me into the weekly Again Faster Workout. I felt fresh at virtually every workout. 6:00 a.m. 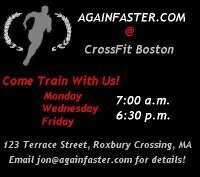 Lifting (Squats, Olys, Press Variations, Weighted Chins/Pullups) followed by short WOD-like circuits (Abs/Back or Push/Pull). I was cramming 6-7 workouts in every week, but I wasn't nearly as fatigued as I'd been in the past, following the three-on, one-off Crossfit template. The most obvious answer is the lack of WODs. A strenuous lifting program doesn't have the hit-by-a-bus effect you get from a standard Crossfit doublet or triplet. I operated primarily in the phosphagen/ATP and glycolytic pathways (0-2 minutes of effort), leaving the oxidative pathway to its own devices. I never felt the attendant hormonal rush of the ultra-high-intensity WODs, perhaps due to my exclusion of this energy system. I believe the lack of longer-duration intensity reduced my recovery needs significantly. Joint mobility training contributed a lot to my energy levels. Dynamic and static stretching, combined with movement through an ever-increasing range of motion, left me feeling calm and refreshed at the end of the day. 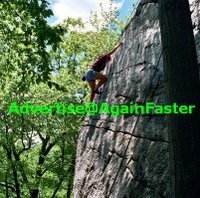 I don't know the exact reasons this training eased muscle soreness and fatigue, but I'm convinced it had a tremendous effect. The addition of a third rest day to the week gave me almost 48 hours of downtime between my Saturday and Monday workouts. The recuperative effect of extended rest is obvious. Every day, I was supplementing 3-4 grams of DHA and EPA (Omega-3s) via fish oil, 5 grams of creatine, and 60 grams of whey protein and BCAAs. DHA and EPA reduce inflammation, while creatine serves as a precursor to ATP, the molecule that serves as fuel for the muscles. Whey protein and BCAAs (branched-chain amino acids) give muscles the building blocks to recuperate after exercise-induced damage. I was giving my body the materials it needed to recover. Combined with a steady diet of lean meats, some vegetables, and significant fruit intake, the supplements definitely aided my efforts. As I move forward with my training, I'm reincorporating the WOD into my schedule. Although I'm not convinced of the superiority of two-a-day workout sessions, I'm going to continue with them, closely monitoring my performance and recovery. Following six weeks of strength training, joint mobility work, and the occasional WOD, I set several PRs. My Fran time dropped significantly, Tabata scores increased, and my maximum pullups and dips are beyond my expectations. Coincidentally, Chad Waterbury published an article on two-a-day, full-body training during the third week of my efforts. He recommends two recovery days between double sessions, along with strict attention to nutrition, stretching, and power napping. T-nation isn't my first source for articles, due to the nausea-inducing preponderance of steroid information, but I was intrigued at Mr. Waterbury's findings. The similarities between our programs are striking, although they're completely unintentional. If you plan to undertake two-a-days, make sure you're up to the task. Adequate general physical preparation, sleep, nutrition, and scheduling are necessary to make it work. It's an intense effort, and it's not for everyone. After a month or so, I'll pit the two-a-day WOD/kettlebell schedule against the three-on, one-off schedule, and see where it leaves us. As if you had any doubt, Coach is probably right about the scheduling too. You can download a free issue of the Performance Menu, courtesy of the fine folks at Crossfit Norcal. Click here. 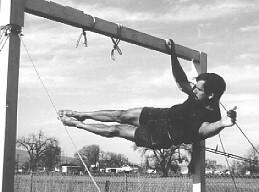 Photo of John Gill, an athletic monster who I'm NOT comparing myself to EVER, courtesy of trainingforclimbing.com. I was very enthusiastic about your ideas, but now don't know what direction to head. I don't think, to sum your suggestion, that building up a series of 8, 100 meter sprints into a continuous string of 15 sec. 100 meter sprints is very sound advice. It rather suggests that you may have some discomfort with the art of running, training, and achieving the personal goals that I may have for myself. 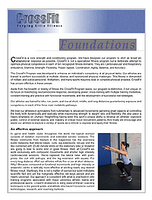 Are you certified to create workouts and to offer advice to athletes? If it is true that you may have had discomfort, why did you make a suggestion when it would've been just as valid to say "I don't know". Your workout ideas remind me of those people that try out for reality TV shows. They think they can sing and dance, and many of the teach classes, but in reality they typically can neither sing nor dance. 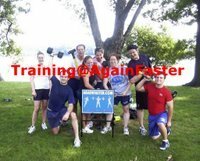 At any rate, I referred my running group to your blog, so maybe some of them will join in the conversation. I think many of them want that the same thing that Again Faster wants and am hopeful that we can all benefit from one another! I offered my suggestions solely as a matter of courtesy to you. You're free to disregard them if you've found more qualified/better advice. I have no "discomfort" with running or sprinting. Because I am not a specialist in the discipline, your running group may be better situated to help you. My only qualification for working with athletes is constant work with athletes. I've seen the technique I described work for several Crossfitters, although they don't approach your sprint times. Please don't discount my advice without trying it first. You'd mentioned that you'd had no success improving your times in the past, so I'm a bit surprised that you're unwilling to try something new. 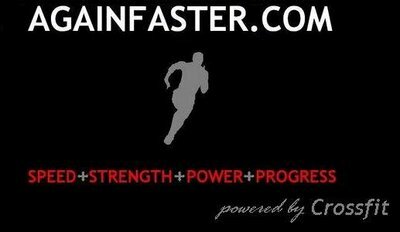 Squatting will aid power generation, and increased attention to sprint mechanics will improve your stride rate. The fastest in the world are those who put the most power to the ground as efficiently as possible. 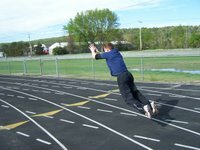 My knowledge of sprint mechanics comes from publicly available sources. I'm well read on the subject. As always, I'm here to help. I hope you find the answer to your performance needs. If you find the answer, I'd love to hear how it goes. Any alternatives to my suggestions are more than welcome. I would like to ask you the same question that you have asked Jon. Are you certified or train under anyone who is certified to design programs for athletes? I believe Jon's advice or suggestions on improving your run productivity hold true. The one thing I have learned about Jon is that he does not offer up any advice or suggestions without calling on his experience and any other resource necessary to ensure he is offering the most suitable advice to you as an individual. What works for me, may not work for you. What works for your friend in your running group, may not work for you. "2m 10s half mile and 4m 45s mile." These are extremely commendable times. What are your goals? You took the time to post questions and comments to find answers, why not take the advice and attempt them before shooting them down?